The ClickN Kids Tablet is a new children's tablet that comes with a comprehensive phonics app for teaching kids to read. It's a sub $100 7" Android tablet that comes in a range of colors and has a parent mode as well as a child mode with parental controls. I've had the chance to try out the tablet with my 5 year old son who is currently learning to read. He has used a LeapPad and an InnoTab and has access to Android tablets including a Kindle Fire and also an iPad. So we've got a good basis for comparison. In this review we'll take you through the features of the ClickN Kids tablet and how they compare to other devices on the market. This tablet really needs to be understood together with the included Looney Tunes Phonics app which is excellent, rather than simply as a fairly cheap kids Android tablet. DISCLAIMER: Tech Age Kids was provided with a Click N Kids Tablet for review. I don't feel that this affects my judgment but want you to be aware of this. The ClickN Kids tablet has a 7" screen, 1.5GHZ dual processor and 1GB of memory. Quite a reasonable specification and we found it responsive. Definitely not top of the range, but I don't feel this is necessary in a tablet for children. It's an Android tablet with the Google Play store and it uses Kids Place to manage parental controls. This means you have access to a huge range of apps that will entertain and educate kids. The ClickN Kids tablet has a front facing camera / video camera which is useful for apps that take a photo of the child and making Skype calls. The front-facing position means that it's not ideal for taking photos as it's hard for kids to see the screen while they are taking a picture. The tablet has a respectable 8GB of storage which can be expanded to 32GB by using a micro SD card. This feature is missing on a lot of tablets and is very welcome. The extra storage is particularly useful if you want to load videos onto the tablet for kids to watch offline. The included gel case makes the tablet easy to grip. The ClickN Kids tablets weighs just over 14 oz with the gel case. This compares well to other devcies (the new 7" Amazon Kindle Fire HD) weighs just over 12 oz without a case while the LeapPad Ultra is quite a bit heavier. This does make a difference when kids are holding a device for long periods of time. The tablet comes in a range of 8 different colors. Both the tablet itself and the gel case are colored. We think this is a very important feature. I'm always disappointed when a new kids tech gadget comes out in standard issue blue and pink. Those colors are included in the range but there's plenty of choice for kids like mine who are drawn to a different color. My kids and lots of their friends have a very strong color-preference. We also like that a screen protector is included and fitted to the device. This saves time and money on acquiring one separately. With the gel cover on the power button is recessed and a little tricky for small fingers to press. My son did learn how to do it though. The 7" touchscreen has a resolution of 800 x 480 which is pretty low by today's standards. If you are used to an iPad retina display or Kindle Fire HD display then the ClickN Kids screen looks poor in comparison. Although the resolution is adequate the screen does have a slight fuzziness to it when compared with more expensive tablets. However, my kids didn't notice this at all, the screen was perfectly adequate for them and compares well to their LeapPad and InnoTab devices. The touch screen is responsive. The viewing angle wasn't brilliant. This can be an issue when kids are trying to share the tablet or a parent is observing their child. Clearly there are going to be compromises in a device at this price and they seem to be in the screen. The ClickNKids tablet uses Kids Place for parental controls. You can easily avoid kids being able to access the internet, download apps and make purchases. You set up a parental pin code that allows you to change these setting and also enter grown up mode where the restrictions are removed. I found that it was best to have internet access turned off normally and then just enable it if I did want to allow my son to access the internet for a specific activity. You can decide which apps are visible to a child, and you can set up multiple user profiles. This works well. Although I would have loved to be able to add an app to a child's profile when in grown up mode (where I installed new apps) rather than having to go to the child's profile and re-enter my pin. This is a fairly minor niggle and a feature of how Kids Place works. Kids Place includes a range of fun and educational apps which are preinstalled on the tablet. This is a nice feature for getting kids up and running quickly. They can use the tablet straight away and start trying things out. The scientific calculator was a big hit with my 5 year old. He had great fun doing sums and then started asking me what the numbers with e in them meant! Hmm I think we'll have to wait a while before we get into that. We soon started to add other apps which was straightforward. This tablet comes from ClickN Kids and includes their Looney Tunes Phonics App. This is the absolute highlight of this tablet. The app is a comprehensive phonics program which teaches kids their letter sounds, tricky words, spelling and lots more. Kids are rewarded with Looney Tunes video content. It seems that 5 year olds will do quite a lot to see a funny clip of Sylvester and Tweety Pie! This is a very comprehensive phonics course with many hours of material. It shouldn't be confused with simple apps that just teach a small aspect of phonics. This video shows the online version of Looney Tunes Phonics but will give you an idea of the content. Looney Tunes Phones is aimed at children in PreK-3 and is very comprehensive. It would cost $29.95 for a year's subscription or $49.95 for a lifetime subscription so this is a significant value add if your child is at the right educational stage to use it. You'll get the best value if your child is just starting to read but there are 100 lessons and there was plenty for my 5 year old who is already reading fairly well. 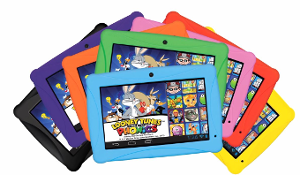 The ClickN Kids tablet makes the most sense if you want to use it for Looney Tunes Phonics and also have access to Android apps on a tablet that comes with parental controls out of the box. At $99.99 this combination is good value for money. Access to the Google market place makes it much cheaper to get access to additional content than if you chose the LeapPad Ultra or VTech InnoTab 3 which have proprietary content. Both the LeapPad and InnoTab have lots of good educational content but they don't have a comprehensive learn to read program like ClickN Kids that takes kids through step by step. Lots of parents wonder whether to choose a learning tablet or a cheap Android tablet. ClickN Kids provides another option. It's also a valid choice as a tablet for parents to share once the kids have gone to bed. If your household gadget budget is limited and you haven't been spoiled by more expensive devices then adults will be able to make good use of this tablet. This year Amazon has a new entry level Kindle Fire HD tablet with a starting price of $139 (subject to change) and access to Kindle Freetime services for kids. The Kindle Fire HD has a higher spec and much better screen than the ClickN Kids and access to a wide range of content. However it doesn't have a camera or a micro SD slot or Looney Tunes Phonics so it will depend on your priorities as to which features are more important. Did my son like it? I went to try out the parental controls and grown-up side of the tablet while my son was at school. Panic! I couldn't find it ... He had put it away in the space he keeps for special things! He really likes it. He loves the fact that it's yellow. And he likes Looney Tune Phonics a lot. He loved his LeapPad when he was younger but I think he's now ready to move to an Android tablet. Honestly I'd probably pick a Kindle Fire HD if I was going to share with him as I love the quality of the screen, but if my budget was lower and he was starting at the beginning of Looney Tunes Phonics then the ClickN Kids would be great value for money. The ClickN Kids tablet is available to buy at Walmart.